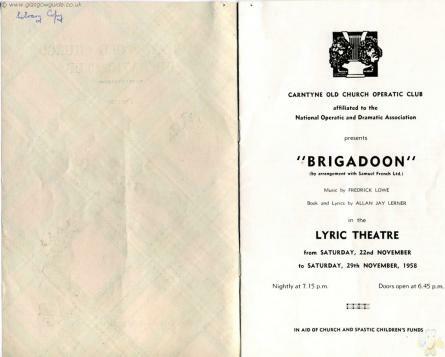 Brigadoon at The Lyric Theatre, November 1958. 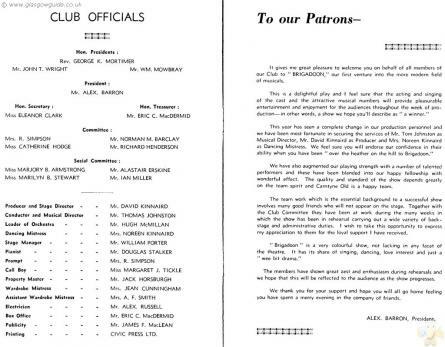 It gives me great pleasure to welcome you on behalf of all members of our Club to " BRIGADOON," our first venture into the more modern field of musicals. 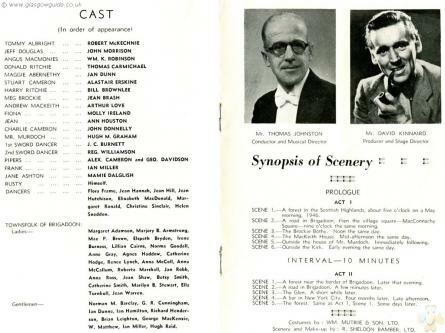 This is a delightful play and I feel sure that the acting and singing of the cast and the attractive musical numbers will provide pleasurable entertainment and enjoyment for the audiences throughout the week of production—in other words, a show we hope you'll describe as " a winner." This year has seen a complete change in our production personnel and we have been most fortunate in securing the services of Mr. Tom Johnston as Musical Director, Mr. David Kinnaird as Producer and Mrs. Noreen Kinnaird as Dancing Mistress. We feel sure you will endorse our confidence in their ability when you have been " over the heather on the hill to Brigadoon." We have also augmented our playing strength with a number of talented performers and these have been blended into our happy fellowship with wonderful effect. The quality and standard of the show depends greatly on the team spirit and Carntyne Old is a happy team. The team work which is the essential background to a successful show involves many good friends who will not appear on the stage. Together with the Club Committee they have been at work during the many weeks in which the show has been in rehearsal carrying out a wide variety of backstage and administrative duties. I wish to take this opportunity to express my appreciation to them for the loyal support I have received.
" Brigadoon " is a very colourful show, not lacking in any facet of the theatre. It has its share of singing, dancing, love interest and just a wee bit drama." The members have shown great zest and enthusiasm during rehearsals and we hope that this will be reflected to the audience as the show progresses. We thank you for your support and hope you will all go home feeling you have spent a merry evening in the company of friends. TWO hundred years ago BRIGADOON vanished into the Highland mists. It does not appear on the map, but to the surprise of two American tourists, TOMMY ALBRIGHT and JEFF DOUGLAS, this mysterious village takes shape before their eyes. Bewildered, they cautiously approach and there they meet FIONA MACKEITH and MEG BROCKIE. Tommy and Fiona find mutual understanding, but Jeff is constantly on his guard against the unwanted advances of Meg. They are informed that JEAN, Fiona's sister, is to be married to CHARLIE CAMERON, and accept a cordial invitation to attend the wedding. While waiting at the MacKeith house for the ceremony, the Americans examine the family Bible. 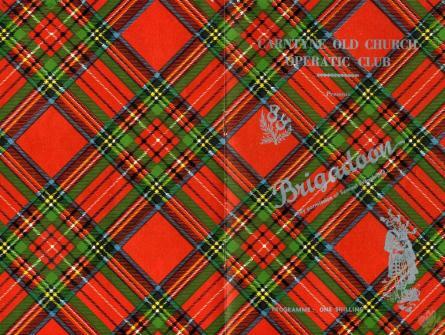 The dates of entry startle them and they conclude that they are dreaming, or, that there is a lot to be explained about Brigadoon. Fiona is consulted but decides to take them to MR. MURDOCH, the Dominie, who relates the miracle. He informs them that the village appears but for one day in every hundred years. That no villager may leave Brigadoon as that would end the miracle. Yet, he explains, if a stranger " toved a villager strongly enough to make him leave the outside world for ever, then he could stay, because " If you love someone deeply, anythin' is possible." Jean and Charlie are married in simple Scottish style by Mr. Murdoch and the clans dance in traditional celebration. While the merriment is at its height, HARRY RITCHIE, also in love with Jean, unable to contain his jealousy any longer, attacks the bridegroom with a dirk. Tommy comes between them and tragedy is averted as he throws him to the ground. Rising slowly, Harry astonishes the villagers by shouting in his torment that, if he cannot have Jean, then he will leave the village and break the spell for ever. He speeds to the forest, chased by the startled clansmen. Unhappily, yet fortunately, his dash ends in death. His body is brought back to Brigadoon. Tommy, with very mixed feelings, relates to Fiona his desire to return to America. He is engaged to a girl back home and, very unsure of himself, must prove where his true love lies. Back in America he explains to his fiancee why it is impossible to marry her and finally decides to return to Brigadoon. Jeff and he return to the Highlands. Mr. Murdoch appears through the mist and takes Tommy across the bridge saying " I told ye, when ye love someone deeply, anythin' is possible—even miracles." THIS is always the most pleasant and at the same time the most difficult task in the preparation of a programme. Our friends who have assisted ? 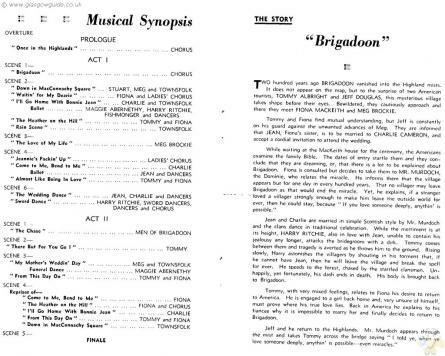 the preparation and presentation of " Brigadoon " are too numerous o mention individually. In the background of a successful production there are many friends /hose names never appear in neon lights but without their work the show rauld never reach the footlights. We readily acknowledge the value of these services and record our hanks. Now all that remains is to thank you, dear patron, for your generous upport. 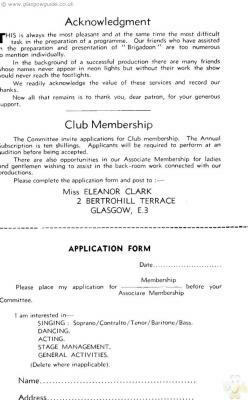 The Committee invite applications for Club membership. The Annual subscription is ten shillings. Applicants will be required to perform at an audition before being accepted. There are also opportunities in our Associate Membership for ladies and gentlemen wishing to assist in the back-room work connected with our productions. Did you know that originally the film was to be made in Scotland, Gene Kelly arrived here and went on location to check it out but they said wasnt suitable for the fairy tale film so it was all made on set in Hollywood.. shame as loads of good films were made in this country using our beautiful sets, did anyone see the Magdalene Sisters on Film 4 two nights ago.. it was all filmed here in Galloway.. first time Ive seen it , was shocking he way young girls were treated by the church..